Desh Bhagat University Faculty of Ayurveda & Research and Faculty of Nursing celebrated World Health Day with full enthusiasm. Under this programmer, the students of both the faculties took part in different activities. 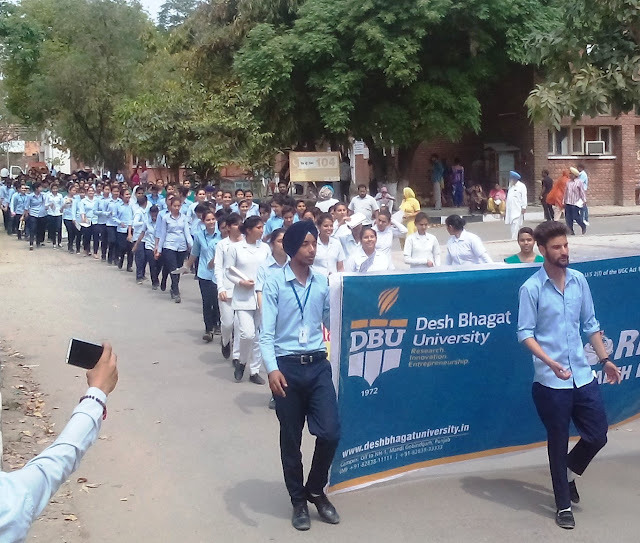 The students organized a rally and went from door to door to make the people aware against Diabetes, Drugs, Cancer, Epilepsy and other different diseases. Colorful banners and placards with awareness messages like Eat Healthy Beat Diabetes, Follow Medical Advice and Eat Healthy Be Active etc. were carried by the students to educate the residents. Director Faculty of Nursing Dr. Ramandeep Dhillon said that this year World Health Organization (WHO) is focusing on Diabetes Awareness. She informed that our students also distributed pictorial pamphlets to spread awareness about diabetes and other diseases among the local residents and surrounding areas. The students motivated them to keep away from all kinds of drugs and also exhorted them to make others aware. They also urged the people to keep their surroundings clean and green and grow maximum number of trees. Director Faculty of Ayurveda & Research, Dr. Kulbhushan said that on this particular day, students also participated in painting and quiz competitions. University Chancellor Dr. Zora Singh and Pro Chancellor Tajinder Kaur appreciated the initiative taken by the students of both the faculties. Vice-Chancellor Dr. Virinder Singh also appreciated the move and said that such programmes are very helpful for the people, especially for the rural area people in making them aware.